Sidebar question: When did Liberals become aware that they had a unique, different, and coherent view of the world? why was there a greater flourishing of CL then? emergence of new ideas about liberty? 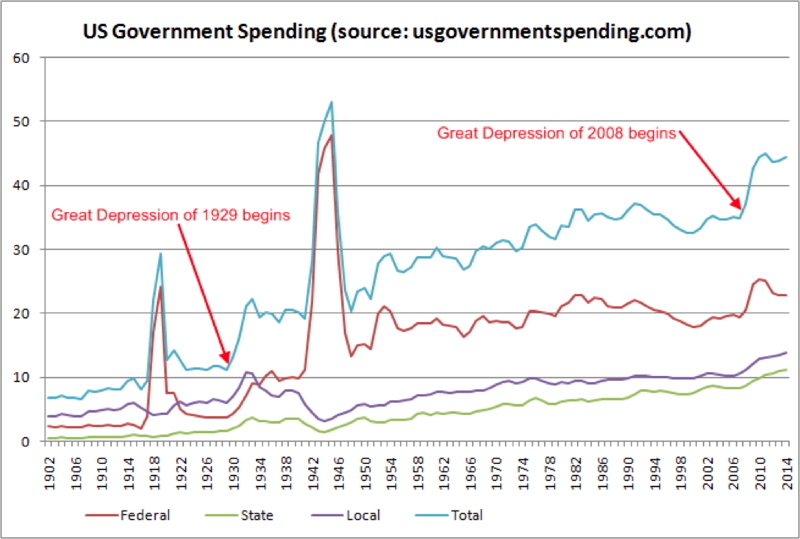 reaction to increases in State Power or crises in the State (war and debt)? what role do ideas and interests play in human behaviour/action (Mises’ theory)? how do people come to hold the ideas they hold? how and why do the ideas people hold change over time? how can reformers (like CLs) best go about changing the ideas people hold? is Classical Liberalism the same as Libertarianism? when did people with CL ideas first become self-conscious about having a different and coherent way of viewing the world? David Conway, “Classical Liberalism” in The Encyclopedia of Libertarianism, ed. Ronald Hamowy (Los Angeles: Sage, 2008. A Project of the Cato Institute), pp. 295–98. Quote, pp. 295–96. Originally in David Conway, In Defence of the Realm: The Place of Nations in Classical Liberalism (Aldershot, UK: Ashgate Publishing, 2004). Liberalism is a political ideology distinguishable from other ideologies by its assignment of a much greater political importance and value to human liberty, understood as a condition of being subject to as few constraints and restraints imposed by others as possible. All liberals agree that human beings will suffer deliberate constraint and restraint as each others’ hands if there is no system of law limiting their powers over each other. Accordingly , liberals regard laws that prohibit these constraints as being conducive to, rather than destructive of, liberty. Liberalism only acquired its name in the early 19th century, well over a century after the ideology began to take shape. Classical liberalism is the original version of the ideology. It received its qualifying adjective only in relatively recent times from the felt need to distinguish the original version from later forms of liberalism that differ from it significantly. Daniel B. Klein, “The Origin of ‘Liberalism’”, The Atlantic, 2 February 2014 http://www.theatlantic.com/politics/archive/2014/02/the-origin-of-liberalism/283780/. The CLT first emerged as a reaction to the excessive power of the absolutist state and church in early modern Europe (16th and 17th centuries). The first rumblings of dissent appeared in the mid–17th century when religious and dynastic wars wracked Europe and reached a climax in the Revolutions in America and France which overthrew the old order and introduced new regimes based upon liberal principles. The WW1 was a disaster for CL and saw the collapse of many liberal institutions which had been created in the 19thC and the near abandonment of CL ideas among people. The Thirty Years War of the 20thC was the nadir of the CL movement until its slow revival in post-WW2 period and creation of modern libertarian movement in the US in the 1970s. 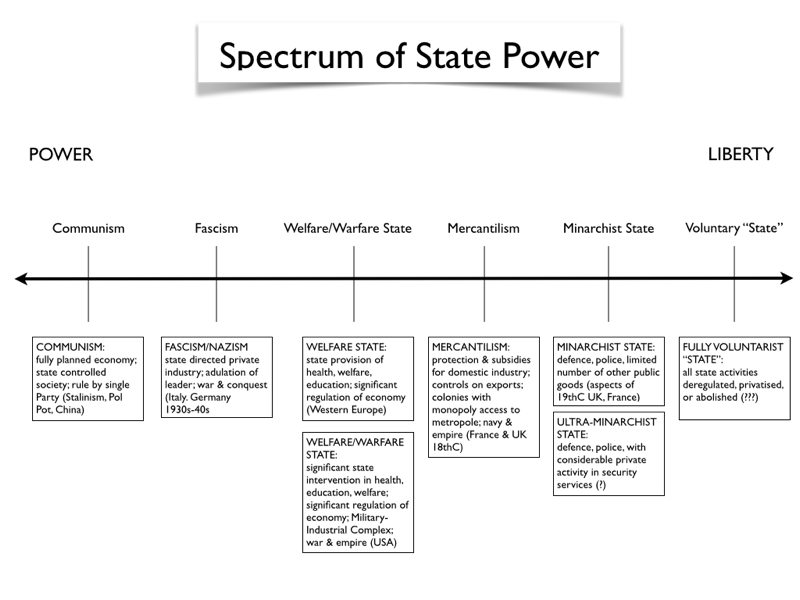 All of the above are activities of the state in various versions. Need to ask, what is the CL theory of the State? what should the Sate do and how big should it be? The following is a list of some significant movements and events during which CLs developed their ideas about liberty and which were fundamental in creating free societies. 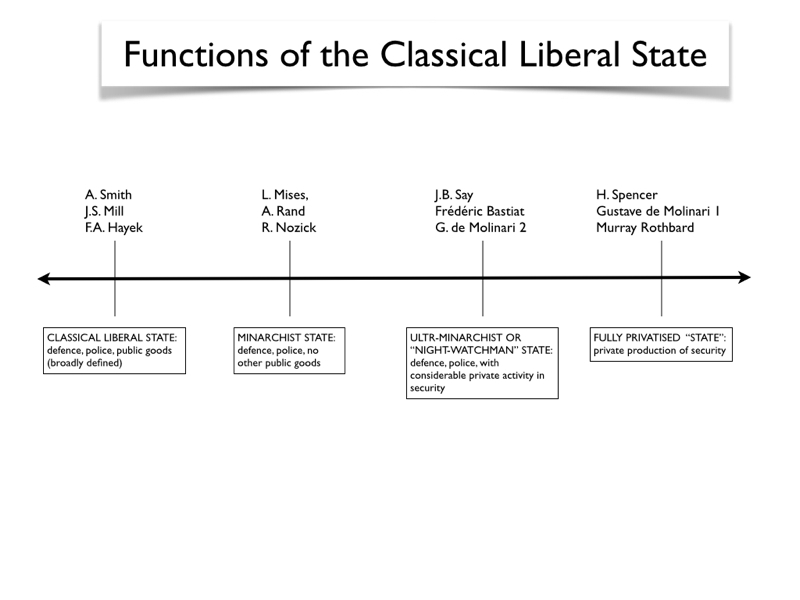 There are four key periods of activity (or “clusters”) when CL ideas were especially prominent and influential, namely the 1640s, the last half of the 18th century, the period of “classical liberalism” during the 19thC, and the post-WW2 renaissance of CL thought and activity. CL first emerged as a reaction to the excessive power of the absolutist state and church in early modern Europe (16th and 17th centuries). Through a series of rebellions and revolutions this power was challenged based upon new ideas about individual liberty which slowly evolved into more coherent and sophisticated theories of how societies, markets, and political institutions worked. CLs had significant political victories, but they were partial ones. 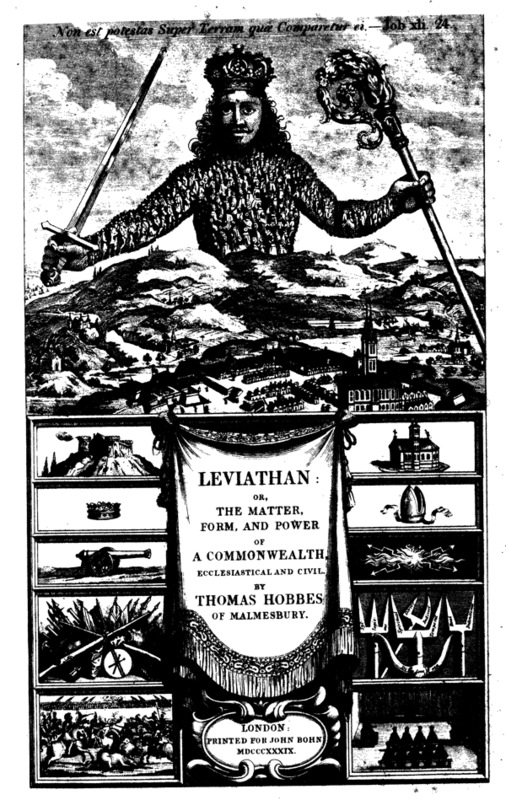 The period from about 1750 to 1850 was crucial in the development of CL ideas as a result of the Enlightenment in Europe and America, the development of economic theory by the Physiocrats and Adam Smith, and the emergence of political theories of limited constitutional government during the American and French revolutions and their immediate aftermath. The heyday of CL was much of the 19th century before CL ideas and institutions were smashed by the events of WW1; let’s say approximately 1830–1914. It was during this period that liberal, democratic, and constitutional societies emerged in Western Europe, North America, and some of the colonies of the British Empire (like Australia). Unfortunately this experiment in liberty was all too brief before rampant statism, militarism, fascism, bolshevism, and welfare-statism seriously undermined it. We are now living in a contradictory moment in history when we have never been as prosperous, educated, healthy, and “free” (in some important areas such as discrimination against people of colour, women, and homosexuals) yet at the same time the burden of the state in terms of taxation levels, inflation, debt, regulation, and surveillance and regulation of our personal lives have never been greater. So I would conclude that the great CL experiment has only partly been achieved and that there remains a great deal to be done before the promise of a fully free society can become a reality. 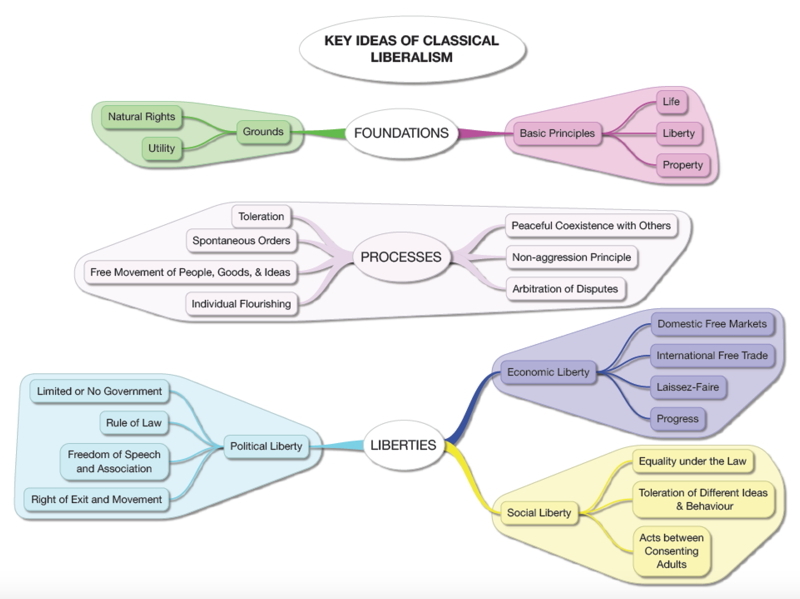 This idea map is designed to give you an overview of what I think are the essential features of the classical liberal tradition as it has evolved over the past 400 years. And what is liberty, this word that has the power of making all hearts beat faster and causing agitation around the world, if it is not the sum of all freedoms: freedom of conscience, teaching, and association; freedom of the press; freedom to travel, work, and trade; in other words, the free exercise of all inoffensive faculties by all men and, in still other terms, the destruction of all despotic regimes, even legal despotism, and the reduction of the law to its sole rational attribution, which is to regulate the individual law of legitimate defense or to punish injustice. Who wrote the first one volume survey of the CL position? Sidebar question: When did theorists become self-conscious that they were advocating a unique, consistent and all-encompassing liberal worldview (Weltanschauung) which could be articulated in one volume; that their ideas were interconnected, were based upon a well thought out set of fundamental principles, and resulted in a comprehensive set of proposals for liberal reform? 501 Quotations about Liberty and Power: The Collected Quotations from the Online Library of Liberty (2004–2014) (Indianapolis: Liberty Fund, 2015). http://oll.libertyfund.org/titles/2648. See also The OLL Reader: An Anthology of the Best of the Online Library of Liberty [Updated February 13, 2015 - 72 extracts] http://oll.libertyfund.org/pages/best-of-the-oll. Key Text: The Encyclopedia of Libertarianism, ed. Ronald Hamowy (Los Angeles: Sage, 2008. A Project of the Cato Institute). Quotations about Liberty and Power http://oll.libertyfund.org/quotes : a selection of over 500 quotations from the most important texts in the OLL collection arranged by topic. a compilation of 501 quotes in various ebook formats can be downloaded from here http://oll.libertyfund.org/titles/2648. (Classic and Modern, in chronological order). 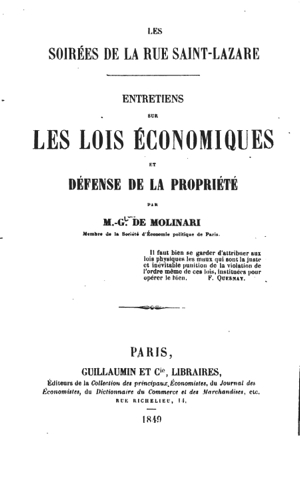 This is a list of one volume surveys of the classical liberal position which have appeared over the past two centuries. The defining characteristic is that they are an attempt to provide the reader with a survey of the basic political and economic principles behind the classical liberal tradition as well as some concrete proposals for reform in order to bring about a freer society. With the exception of Wilhelm von Humboldt’s The Limits of State Action which was written in 1792 but was not published in full until 1854, it seems that it was not until the mid–19th century before people began thinking of classical liberalism as a coherent body of thought which could be encapsulated in a one volume treatment. One Volume Surveys of Classical Liberalism http://oll.libertyfund.org/groups/162. 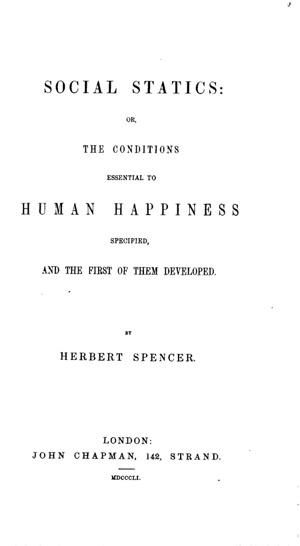 Herbert Spencer, Social Statics: or, The Conditions essential to Happiness specified, and the First of them Developed (London: John Chapman, 1851). http://oll.libertyfund.org/title/273. John Stuart Mill, On Liberty (1859) in The Collected Works of John Stuart Mill, Volume XVIII - Essays on Politics and Society Part I, ed. John M. Robson, Introduction by Alexander Brady (Toronto: University of Toronto Press, London: Routledge and Kegan Paul, 1977).http://oll.libertyfund.org/title/233/16550. Herbert Spencer, The Principles of Ethics, introduction by Tibor R. Machan (Indianapolis: LibertyClassics, 1978). 2 vols. http://oll.libertyfund.org/title/1882. Ludwig von Mises, Liberalismus (Jena: Fischer Verlag, 1927). Ludwig von Mises, Liberalism: The Classical Tradition, trans. Ralph Raico, ed. Bettina Bien Greaves (Indianapolis: Liberty Fund, 2005). http://oll.libertyfund.org/title/1463. Friedrich A. Hayek, The Constitution of Liberty (Chicago: Henry Regnery, 1960). Milton Friedman, Capitalism and Freedom (1962). Murray N. Rothbard, For a New Liberty (New York: Macmillan, 1973). Revised edition 1978. One should begin with Steve Davies’ “General Introduction,” EoL, pp. xxv-xxxvii, which is an excellent survey of the ideas, movements, and key events in the development of liberty, then read some of the articles on specific historical periods, movements, schools of thought, and individuals. Items in quotes are entries in the EoL.